The specification for these states the minimum turn on voltage is 4v, are they working reliably at 3.3v? I can only tell you that I pulled 2 out of the packet of 5 – and tried them and using +v reference, they work perfectly with 22w compact fluorescent lights. Amazingly I wanted to test them with something more substantial – and I don’t have a single higher power light in the house!!! I would go and buy a 100w lamp but they don’t sell these in the UK any more!!! I’ll see if I can find something more substantial. With a 22w light they run freezing cold. I think that Glen concern was about the voltage controlling the relay and not how much it can handle in the load side. (That was my thoughts too). 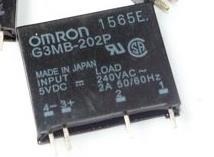 Maybe because it’s a replica it works on 3.3V (The cheapest Omron G3MC-202P DC5 cost 3.5$ in quantity of 5000 pcs). Well, NEITHER are recommendations as my testing on the larger units is down to one lamp and I’ve not received the new little DIP unit yet – they are simply brought to your attention as something to consider. Hopefully over the weekend I’ll get to do some more substantial testing.